Over the years, we have been so blessed with donations of clothes, shoes, and toys to pass on to those around us. One of the ways that we give these items out in the Children’s Hospital is through the Baby Closet. This is when we go to the moms who are staying with their little ones and bring toys, hygiene items, and clothes for their babies. We prepare bundles of clothes throughout the week, and then every Friday morning 2 or 3 of us go throughout a few of the wards to encourage the moms and bring these little gifts to brighten their day. Some of the moms have children who get sick often, so we get to know them after a while and visit throughout the week during hospital shifts. 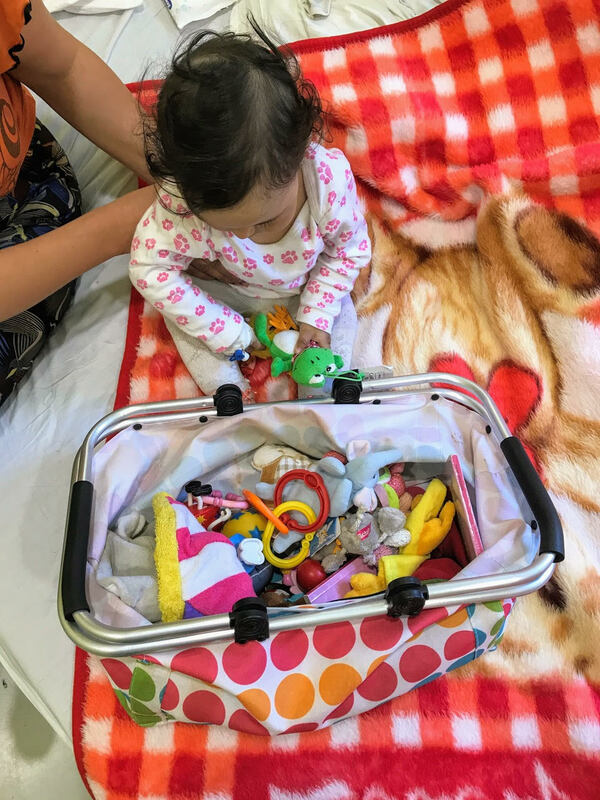 Their babies get to know us too and are so excited when they see us coming with the basket of toys! How sweet to be able to not only take care of the babies and toddlers who are there alone, but also encourage and bless the moms who are staying with their little ones? Sometimes while going to the moms and their babies, we’ll also have toys for the older kids who are staying there alone. Recently, there was a 12 year old boy who came up to one of us in the hospital and said, “I know you! I was here when I was little and you gave me a toy!” Maybe a toy car doesn’t mean much to some, but to him it meant that we cared and that memory stuck with him. It was a good reminder to stop and visit with the older kids too, and since then we try to have more toys with us to give them. Thank you to all who have donated so many wonderful items, and to our volunteers who have helped make and distribute these adorable bundles of clothes! You are a blessing to us and to so many families and children. Firm Foundations Romania is a non profit organization whose mission is to transform the lives of disadvantaged Romanian children and families by providing physical and educational guidance and sharing the Gospel. Our focus is loving the unloved and providing educational opportunities to the forgotten youth of this country. Our vision is for every disadvantaged Romanian child to experience the power of God’s love in order to live life to the fullest; our hope, that they would then be influenced to serve others and be an example for the people of Romania. Learn more about how you can volunteer or help support their work here. On MissionFinder, we have over 1,000 ministries offering opportunities like this to serve at home and around the world. Does your church or organization need help organizing mission trips? Check out our partner site, MissionMinder.com. Their easy to use software will help you manage all the details for your short-term mission trips and team members online. Unlimited Trips. Unlimited team members. Easy online fundraising for your team members. Try it free for 30 days. Learn more here.